"The Wars to Come". Unsullied Eyes is a discussion space for Game of Thrones viewers who have not read the books. 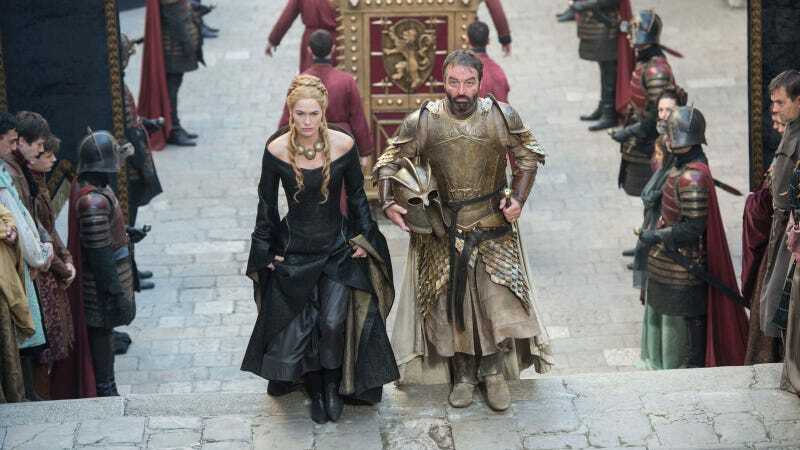 Be warned that there are spoilers for the latest aired Game of Thrones episode after the jump. The purpose of this discussion space is so that we can talk about the show as is. Book readers are welcome, but please refrain from making comparisons, hints, or spoilers. Welcome back to Unsullied Eyes! This week, we return to Westeros to find our heroes and antiheroes almost exactly where we left them in the season 4 finale. We start off with a rather ominous prophesy in a flashback. This does not bode well for Tommen and Myrcella. I will never get used to the stone eyes over corpses thing. Olly and Ser Alliser are back! Olly is my hero. I'm very much liking Melisandre and Stannis constantly scheming. Brienne's attempted breakup with Pod was heartbreaking. We have two new factions joining the show. One is the Sparrows and the other is the Sons of the Harpy. Sparrows are ascetic monks and Sons of the Harpy are underground rebels? Olyvar the male prostitute is back! Will he be a regular? Ros left some very big shoes to fill. So Varys is on #TeamDaenerys. I suppose it was hinted heavily when he was seen consorting with a Pentoshi lord who brokered Daenerys' "wedding" with Khal Drogo in the very first episode. Daenerys would fit into Varys' requirements of someone who's firmer than Tommen but gentler than Stannis. DRAGONS!!! Poor Viserion and Rhaegar! Mance Rayder is on #TeamStannis? Well. That didn't last long. A bad way to go.